Round 50 of cTrader Weekly demo contest is finally over, and it's our pleasure to announce the brand new winners of the contest! 1st place with the award of $150 goes to Mr. Dony Fitrah from Indonesia. 2nd place with the award of $100 goes to Mr. Rizwan Ahmed from Pakistan. 3rd place with the award of $75 goes to Mr. Grigoriy Danilov from Uzbekistan. 4th place with the award of $50 goes to Mr. Kirit Rupala from India. 5th place with the award of $25 goes to Ms. Sri Wahyuni from Indonesia. This contest is an ideal option both for those who are testing their skills or starting out in the Forex market. Are you ready to test your trading skills and win one of the prizes? Don't miss out! 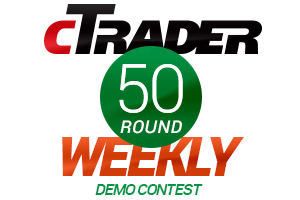 Then open a demo account to participate in the next cTrader Weekly demo contest round! Don't forget to check our website for more great offers! With the success and popularity of our promotion for users of MT4, we are now introducing it to cTrader users. OctaFX is all about driving Forex trading to new levels and we are proud to announce a 50% deposit bonus for cTrader users!